“We would like to clarify that our sponsorship of the Public Theater does not fund the production of Shakespeare in the Park nor do we condone the interpretation of the Julius Caesar play,” the credit card company wrote in a statement on its Twitter account Monday morning. The Oskar Eustis-directed production of the classic Shakespeare play has sparked controversy for its titular character’s close resemblance to President Trump. The Caesar character, played by actor Gregg Henry, sports a blond hair-do and a business suit, while his wife Calpurnia (actress Tina Benko) speaks with a Slavic accent, similar to that of First Lady Melania Trump. 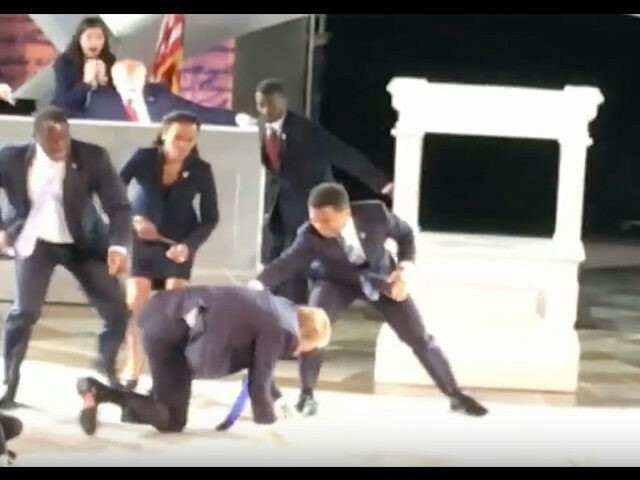 In the play’s climax, the Trump-like Caesar is brutally stabbed to death by his associates in the Senate, in a scene that one attendee later told Mediaite she found to be “shocking and distasteful.” Inside Edition posted footage of the controversial scene on its website last week. In the wake of the controversy, Delta Air Lines and Bank of America have pulled their sponsorships of the Shakespeare in the Park program, which is free to attend. Other sponsors of the Public Theater include the Time Warner Foundation, New York magazine and the New York City Department of Cultural Affairs. Shakespeare in the Park’s Julius Caesar opened in previews last month and is set to begin its limited run at Central Park’s Delacorte Theater on Monday.